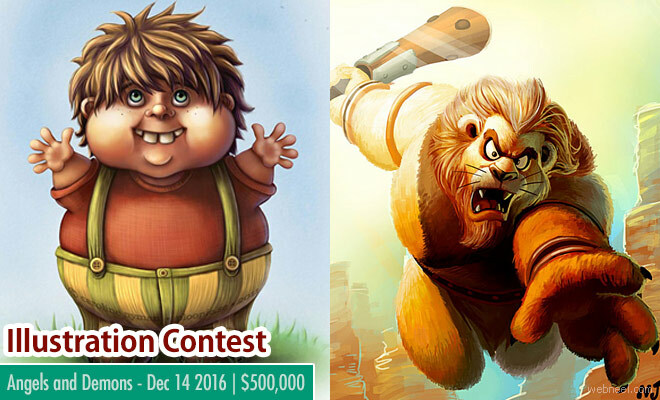 Here is an amazing chance to win a mind blowing cash prize and all you have to do is illustrate on a theme 'Angels and Demons' and send your entries online before December 6th, 2016. There are five challenges to be completed in this series and currently the third challenge is 'Angels and Demons'. The winners will be announced on December 14th, 2016. The contest has been organised by Grafolio and judged by an international jury. There is no limit to the number of images which can be submitted. Even if you haven't participated in the previous challenges, your work may take you to the finals. All that you have to do is register yourselves in grafolio.net/ and you could be the next lucky winner. Amateurs and professionals around the world can participate in the series of challenges. After all 5 challenges have been completed, 30 participation prizes will receive an additional prize of $5000 per person. The final winners are chosen after the jury's selection at Grafolio and its also based on the number of likes gained by each person for their works.